Chapter 1. What is Performance-Based Learning and Assessment, and Why is it Important? In the act of learning, people obtain content knowledge, acquire skills, and develop work habits—and practice the application of all three to “real world” situations. 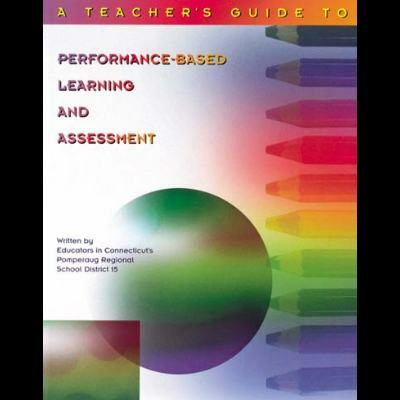 Performance-based learning and assessment represent a set of strategies for the acquisition and application of knowledge, skills, and work habits through the performance of tasks that are meaningful and engaging to students. Performance-based learning and assessment achieve a balanced approach by extending traditional fact-and-skill instruction (Figure 1). Performance-based learning and assessment are not a curriculum design. Whereas you decide what to teach, performance-based learning and assessment constitute a better way to deliver your curriculum. Teachers do not have to “give up” units of study or favorite activities in a performance-based classroom. Because authentic tasks are rooted in curriculum, teachers can develop tasks based on what already works for them. Through this process, assignments become more authentic and more meaningful to students. Traditional testing helps answer the question, “Do you know it?” and performance assessment helps answer the question, “How well can you use what you know?” These two ways of looking at literacy do not compete; the challenge is to find the right balance between them (Figure 2). Figure 2. What Is the Balance? The subject area content can come from already defined curriculums or can be enhanced by the adoption of a set of themes or topics by the department, grade-level team, school, or school system. Higher-order thinking or process skills can come from the various disciplines, such as writing or proofreading from language arts or math computation and problem-solving skills. Other process skills cut across subject area lines or may be identified as areas of need based on standardized testing (e.g., analogies, categorizing information, drawing inferences, etc.). Time management, individual responsibility, honesty, persistence, and intrapersonal skills, such as appreciation of diversity and working cooperatively with others, are examples of work habits necessary for an individual to be successful in life. Performance tasks build on earlier content knowledge, process skills, and work habits and are strategically placed in the lesson or unit to enhance learning as the student “pulls it all together.” Such performance tasks are not “add-ons” at the end of instruction. They are both an integral part of the learning and an opportunity to assess the quality of student performance. When the goal of teaching and learning is knowing and using, the performance-based classroom emerges. Performance tasks range from short activities taking only a few minutes to projects culminating in polished products for audiences in and outside of the classroom. In the beginning, most performance tasks should fall on the short end of the continuum. Teachers find that many activities they are already doing can be shaped into performance-learning tasks. The initial move to any new method involves an investment in time. The development of performance-assessment tasks is no exception. With a little practice, however, teachers find that they can easily and quickly develop performance tasks and assessment lists. This process is further simplified as teachers and schools begin to collect and maintain lists of generic tasks and assessments that teachers can adapt for individual lessons. Teachers find assessment lists a more efficient way of providing feedback to students than traditional methods, thus saving time in the long run. Finally, as students work with performance assessment, the quality of their work improves, reducing the time teachers must spend assessing and grading student work. Performance task assessment lists are assessment tools that provide the structure students need to work more independently and to encourage them to pay attention to the quality of their work. Assessment lists also enable the teacher to efficiently provide students with information on the strengths and weaknesses of their work. In creating performance task assessment lists, teachers focus on what students need to know and be able to do. One result is that teachers can more consistently and fairly evaluate and grade student work. Information from performance task assessment lists also helps students set learning goals and thus helps teachers focus subsequent instruction. Parents can also use assessment lists to monitor their student's work in school and to help their children check their own work at home. The upper-level format (Exhibit 1) is used in middle and high school. It lists the important elements and provides three columns of lines. On the first column of lines, the teacher indicates the points each element is worth. Some elements receive more points in order to focus students' attention on skills in need of improvement. These point values are based on the objectives of the task or lesson. Some elements receive more points because they are more important. These point values are determined by the teacher or could be decided by the class and the teacher together. Students get this assessment list, with the points possible for each part of the task listed “up-front,” as they begin a performance task—which in this case calls for a graph. At this point, students are also shown several examples of “excellent graphs,” either done by previous students or from professional sources such as magazines or texts. These models serve as “benchmarks” (see next section), which the teacher can use to illustrate sections of the assessment list. This “no guess no excuse” approach allows students to see the importance of each element and use the list and benchmarks to guide their own work. The list also aids students in time management because they can see what the most important elements are in constructing graphs. Before they submit their work, students do a final inspection of their own graphs and complete the self-assessment column. During this self-assessment step, students often find ways to improve their work. Peer assessment can also take place at this time. The assessment list can be customized to add an extra column for this purpose. Experiences with peer assessment often improve students' self-assessing skills. The final step is for the teacher to assess the work and, at the same time, evaluate the student's self-assessment. When discrepancies are found between the student's self-assessment and the teacher's assessment of the student's work, the teacher may decide to hold conferences with the students who need work on improving the accuracy of their self-assessment. The teacher can also assign a grade, using the teacher's column on the assessment list. For example, earning 90 percent of the points possible might be an A, 80 percent a B, and so on. The assessment provides detailed information about the quality of each component of the work, while the grade identifies “overall” quality. The teacher determines the relative importance of each activity in determining an overall grade point average, just as teachers do with traditional assessments. The elementary format (Exhibit 2) is used for children in the upper elementary grades (3rd–5th). It lists several important elements of the graph and describes three levels of quality for each: terrific, OK, and needs work. Just as with the upper-level format, students are provided with the assessment list “up-front” and shown models of excellent graphs appropriate for this age level. This format also asks the students to assess their graphs “over-all” and justify that opinion based on the details discovered through element-by-element self-assessment. The third format is for children in the primary grades (Exhibit 3). Student self-assessment and teacher assessment are a part of the format of the elementary and primary assessment lists as well. These children color the face and draw hair or a hat on the face that represents the quality of their work—terrific, OK, or needs work. The teacher indicates agreement or disagreement and talks with the child about his work and self-assessment. When teachers at a grade level, school, or school district use and adapt similar assessment lists for student work such as graphs, students encounter a common framework for learning from subject to subject, from grade to grade, and from school to school. Overall, student performance is improved by this common focus and consistency. The details that performance tasks provide and the interaction between the student's self-assessment and the teacher's assessment focus the student's attention on the elements of quality for the various skills and content that they encounter throughout their education. Students need to see examples of excellent work, or “benchmarks” of quality, for their grade and ability level. Besides using an assessment list to learn about the specific elements that will be used to assess the quality of their work, students must see what quality looks (sounds, feels, smells, or tastes) like. Over time, teachers collect sets of excellent work such as graphs, nonfiction writing, solutions to open-ended math problems, and designs for science experiments from students. Flawed or not-so-excellent work may also be used in the process of teaching students how to use the assessment lists and benchmarks. Let's look at three benchmark graphs for the three performance tasks described earlier: Exhibit 4 shows a graph about caterpillars in the dark versus light (graph made by a primary student); Exhibit 5 shows a traffic count in front of school (made by an elementary student in the 3rd–5th grade); and Exhibit 6 shows traffic fines for speeding (made by a middle or high school student). How would you feel about learning all the rules and skills of a sport, spending months sweating yourself into good physical condition, but never actually playing the game? How much is traditional schooling like this? Schooling frequently centers on individual concepts, facts, discrete skills, and work habits. But how often does a student encounter opportunities to “put it all together,” the way work is done in the “real world”? How often does a student actually get to step on the field and play “for real”? Similarly, it is important to learn how to ask questions, to organize data, to compute, and to write; but to make these skills meaningful, students need opportunities to use such skills in meaningful ways. The Cycle of Learning is a model for “playing the whole game.” Consider the high school-level performance task, “Freedom and Responsibility” (Exhibit 7). Students are provided with data on the number of eligible voters and the number that actually voted in local, state, and federal elections over the past 10 years. The task is to “write a persuasive letter to the editor of your local newspaper, supported by a graph, that describes your opinion. . . . Your purpose is to persuade your audience, not to antagonize.” The assessment list the students use (Exhibit 8) allows the students to check their organization, clarity of writing, use of supporting data, and other elements of effective persuasive writing. The assignment is a real task—the letter will go to a real editor; and the assessment is part of the learning process, or cycle (see Exhibit 9, “The Cycle of Learning”). The Cycle of Learning shows the steps through which the learner will go to complete the “Freedom and Responsibility” task in Exhibit 7. Steps 1–4 of the cycle are structured through performance task assessment lists. For this task, students will use the assessment lists for persuasive writing and for creating a graph. Both during and at the end of these four steps, the student uses performance task assessment lists provided by the teacher or made by the student, such as that in Exhibit 8. The student is also asked to evaluate her work—to make a judgment about the degree to which the writing and graph represent her best effort to meet the requirements of the assignment. The student's answer leads the student toward setting goals for further improvement of writing and graphing. Many performance learning tasks will be only parts of the Cycle of Learning, while others will take the student through the entire cycle. As the student completes projects that engage the entire cycle, the student's work improves and she feels more and more capable of being successful with this kind of work. As the valid self-perception of capability grows, the student is more willing to expend the energy to begin and complete a quality product. The Cycle of Learning thus becomes a cycle of improving student performance. Competencies from the “disciplines” include knowledge from such areas as the arts, humanities, language arts, physical health/health, science, math, and technology. Interpersonal competencies include communication skills, cooperative learning, and courtesy. Intrapersonal competencies include work habits such as organization, time management, and persistence. All three types of competencies are the “gears” that mesh with the “Cycle of Learning Gear” (Exhibit 10). When all competencies are working together, the Cycle of Learning turns. When one or more competencies do not work, the Cycle of Learning does not turn well. Schooling includes improving student discipline-based competencies, interpersonal competencies, and intrapersonal competencies. The Cycle of Learning engages the student of any age in a process that is strongly influenced by the learning environment of the classroom, school, school district, state/region, and nation. Administrators, teachers, and other adults can provide support and encouragement in the form of time, resources, encouragement, and support of creativity and risk-taking. When the adults in the students' environment are themselves enthusiastic, reflective learners who constructively resolve the inevitable conflicts that occur during the change process, the students are more likely to employ these strategies as they learn how to be capable, self-motivated, independent, lifelong learners. Thus, the policies and practices of all the stakeholders in the performance of our youth create the “frame,” which can either support the long-term changes necessary to improve performance or incapacitate these efforts. 1. An appropriate type of graph (line or bar) is used. 2. Appropriate starting points and intervals are used for each axis. 3. There is a main title for the graph which clearly states the relationship between the axes. 4. An appropriate scale is used on each axis depending on the range of data for that axis. 5. Axes are clearly labeled. 6. The independent variable is put on the (X) axis, and the dependent variable is put on the (Y) axis. 7. The data are plotted accurately. 8. The graph should reflect uncertainty of measurement. 9. Trends or lack of trends are depicted on the graph. 10. An appropriate key or legend is part of the graph. 11. The lines or bars use the space of the graph well. 12. Appropriate techniques such as color, texture, or clarifying labels are used to make the graph easier to understand. 13. The whole graph uses the space given it on the paper well. 14. The graph is neat and presentable. 15. The graph is easy to interpret. T: I included my name and the date. O: I included my name and the date but they are in the wrong place. W: I did not include my name or the date. T: The title tells exactly what the graph is about. The title includes a short statement of what I changed and what I measured. O: The title tells what the graph is about. W: The title is missing or it tells little. T: Each axis has a name that explains what that axis is and the data has units. O: The axes need names that are more clear and/or the data needs units. W: The names for the axes and/or the units for the data are missing. T: Each axis has a scale that fits the data in the data table. The scales help use the whole graph well. O: The scales for one or both axes need to be improved. W: The scales are missing or they are incorrect. T: The lines or bars are drawn accurately and very neatly. O: There are some mistakes or the work is a little messy. W: There are many mistakes and/or the work is very messy. T: The whole graph uses the space well. Color or some other technique is used so the graph is easy to read. O: The space is not used too well and color or some other technique could be used better so that the graph is easier to read. W: The graph needs a lot of work on the use of space and color. T: The key or legend is very clear. O: The key or legend is OK.
W: The key or legend needs a lot of work. Did I draw the things in columns? Did I make a separate column for each different kind of thing? Did I print words to tell what each column is? Is my graph drawn neatly? Exhibit 4. Do Caterpillars Like the Light or the Dark? “Be more responsible!” is a phrase often directed to teenagers by adults. But how well do adults “walk their talk?” We live in America, the most free and democratic country in history. Almost every citizen has the freedom to vote. Is it also the responsibility of eligible American citizens to vote? To what degree do the adults in your community carry out their freedom and responsibility through voting? Write a persuasive letter to the editor of your local newspaper, supported by a graph, that describes your opinion on these questions. Your purpose is to persuade your audience, not to antagonize them. Your audience is adults who read the local newspaper. Organize and analyze the data you were given and brainstorm possible persuasive arguments for your letter. Decide on the most appropriate type of graph to display this information in a way which supports your arguments. Write a first draft of the letter and graph. Complete the necessary steps of the editing process to produce a finished letter and mail it to the editor. 1. The writer introduces and clearly states a position. 2. The position is supported by at least four main points. 3. Each main point is supported by at least three relevant, accurate, and specific pieces of information. 4. It is clear that most of the main points and supporting details came from the reference materials. 5. Information from personal experience or data from sources other than the reading materials is provided as additional support to the argument. 6. The main point(s) of the opposing arguments is/are listed and refuted. 7. The argument is made to a specific audience. The writing is crafted to appeal to that audience. 8. The argument is organized and has a flow from beginning to end. 9. There is a powerful concluding statement of the writer's position. 10. Mechanics of English are correct and the writing is neat and presentable. Copyright © 1996 by Educators in Pomperaug Regional District 15, 286 Whittemore Road, P.O. Box 395, Middlebury, CT 06762. All rights reserved. No part of this publication—including the drawings, graphs, illustrations, or chapters, except for brief quotations in critical reviews or articles—may be reproduced or transmitted in any form or by any means, electronic or mechanical, including photocopy, recording, or any information storage and retrieval system, without permission from ASCD.